Things move quickly in the camera world, and it’s no different in the Studio / OB live production part of that world. We have a constant stream of boxes that need to be ticked; 4K obviously, even if we may actually mean UHD; then there’s HDR (High Dynamic range), HFR (High Frame Rate), WCG (Wide colour gamut) and doubtless more TLAs TBA. Sometimes, though, we don’t need to shoot with anamorphic uncoated vintage lenses with shallow depth of field at 4K DCI and P3 colour space when it’s a four camera live stream of the annual conference of the British association of Cheese retailers. Sometimes there’s a need for a sensible, low cost camera system that takes B4 lenses, a decent viewfinder, a proper RCP, and just gets the job done. Cue the Sony HXC-FB80. This is a straightforward 2/3” three sensor camera, with a choice of decent viewfinders, a proper RCP, and fibre interface to a compact camera control unit with all the usual interfaces....but then so was its predecessor, the HXC-FB75. So what’s new? Starting from the front end, it’s a familiar 2/3” B4 lens mount, and 3 CMOS 1920x1080 sensors. Although tempting to go 4K, it’s always a trade off between squeezing more pixels on the sensor and sensitivity, dynamic range, noise, and processing speed. Every time we shift up a gear from SD to HD, from HD to UHD we take a hit on these other factors. The HDC-4300 camera has done extremely well by going full tilt for full 4K on each of its three sensors, but the extra pixel count will reduce your bank balance. And balance is the key; finding that sweet spot where the camera is the right tool for the job. This is pretty much the same front end as the PXW-X400 camcorder and the HXC-FB75, so an established track record of ticking the ‘sensible’ box. 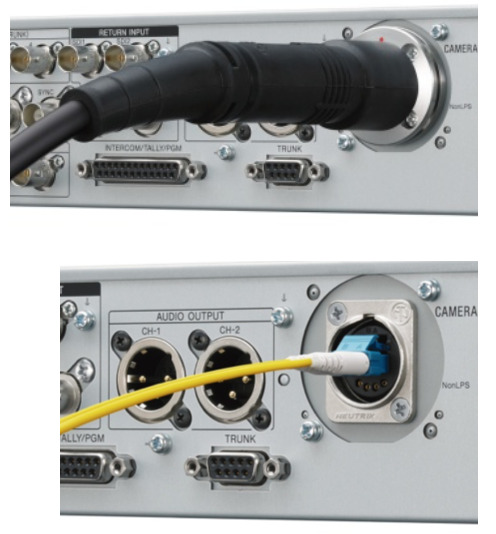 Connection to the CCU is via fibre, and the fibre adapter is built in to the camera body. Two single mode fibres carry all the picture, audio, returns and control data, but of course you will usually need power as well, and this means a hybrid cable. This can be connected either via Lemo or Neutrik connectors. You need to specify at time of purchase which type you prefer, and each system has its plus points. Both will give you around 600m range in normal hybrid cable configuration.
. No joiners required to connect cables.
. Needs joiners to connect cables together. There’s a power extension unit (HXCE-FB70) that allows you to run bare duplex fibres upto 10km, and then injects power and converts to hybrid fibre cable for the last stretch...handy for a studio a long way from the control room. It looks like a fairly straight-forward choice: Lemo for outside broadcast or if you already have installed Lemo cables, Neutrik for self contained studio systems, or if you want the convenience of accessing the fibres directly on the LC connectors. Make sure you order the correct versions! At the other end of the cable is the HXCU-FB80, the usual sort of Sony camera control unit, in a 1.5U full rack width format. There’s a good level of inter-changeability with the HXC-FB75 system, so you can connect new camera and old CCU or FB75 camera and FB80 CCU, though of course you lose most of the new features. Most systems cameras are never switched out of 1080 50i (actually the correct terminology is 1080i/25) but 1080p/50 is gaining ground, and is particularly useful if up-scaling to UHD, which is entirely progressive. A new addition to the output formats is the ability to output 1080p/50 on a 3G BNC connection from camera or from CCU. We all know moving to 4K or UHD is a big step, in both cost and system complexity. There is a third way. It’s not for everyone, and some may view it as cheating, but it’s simple, cost effective, and if it’s done right, will be acceptable for many applications. It is, of course, up-scaling from HD. 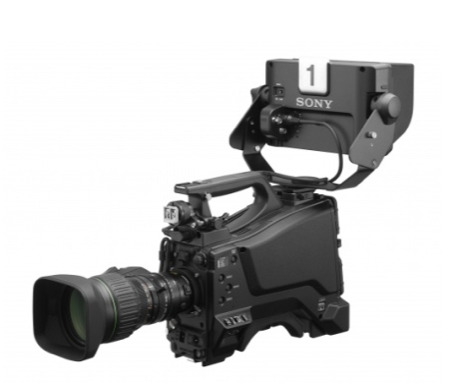 Certain cameras on a UHD live production will struggle to deliver full resolution UHD. Wireless and mini cameras for instance. Up-scaling is a necessary part of life at present, but is generally thought of as something to be avoided. As UHD filters down from the Champions League towards the Vanarama and Line Dancing from Doncaster we may not be able to afford coverage in full fat UHD. It’s a similar concept to the HKCU-2040 option board that can be added to HDC-1700/2400/2500 systems to create 4K. It’s not quite as sophisticated as the HKC-2040, which is able to access an RGB signal from the camera head closer to source than the HXCU-FB80, but the 3G nature of the FB80 transmission system gives it a really good starting point. It looks great. Not as great as the HDC-4300, but then you’d expect that. Good enough? Well that depends who you are, and how much you’re paying. In the end it is acceptable for UHD if the client says it is acceptable. It will also depend on the lens of course. It may not fit the budget, but you can squeeze a little more out of the system with a 4K lens, though HD glass would be the normal choice. 12G is a way of squeezing the four x 3G outputs of a UHD output on to a single connector. (4 x 3G = 12G) Sony have been a bit late to the party with 12G, and seem to have viewed it with some caution. It’s a lot of bandwidth for one copper connection, and connector quality and cable loss need to be managed carefully if your data is not going to fall off a digital cliff before it reaches the end of the wire. However, it’s an awful lot more convenient than running 4 wires if your cable run is short. This is the first Sony product to use 12G, but you can expect to see more in the near future. In Summer 2017 new firmware will allow you to output an HDR signal in the form of Hybrid log Gamma. This is similar to the ’Instant HDR’ options on several camcorders, and will allow you to deliver a signal that can be connected directly to a consumer (or professional) HDR display. HDR will only be available at HD resolution, not UHD. Cameras such as the HDC-4300 usually use the S-log 3 transfer function to deliver HDR, so if you want to integrate into S-log3 world you’d need some further conversion, probably via a look-up table, which may limit performance. Great for something like a live feed for HDR screens in a venue. If you’re in UHD, you can choose to use the wider Rec. 2020 colour space that is part of the UHD package. What you’re doing here is increasing the size of the container that is holding your colour information. The camera is not able to fill the whole 2020 space, but at least the full range of the sensors can be used with no clipping. Simple camera control functions are built in to the front panel of the CCU. For a basic system, as long as you can put the CCUs in a desk type rack, that’s all you need. If you want ‘proper’ vision control, you can use the RCP-1xxxx series panels that have been around for several years. Connect either via Ethernet, with PoE or local power, or via the Sony CCA-5 type cables. It’s also possible to use this camera with an MSU master setup unit in a networked system of up to 24 cameras. 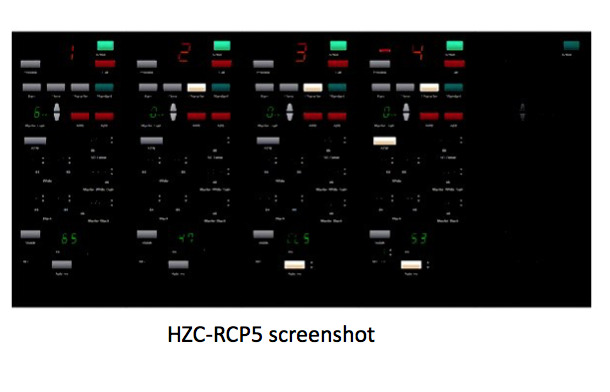 And finally, it works rather well with the latest version of a software based RCP system called HZC-RCP5. This allows GUI based control of up to 5 cameras from a PC. This hasn’t been all that popular in the past, possibly because the GUI interface is not quick enough for live production. A new, rather clever option is to combine control with one RCP-15xx that can be assigned to any of the five cameras. There’s a new connector on this camera, allowing you to use the HDVF series of viewfinders. There’s also the option of fitting the proper v-wedge mount instead of the slightly wobbly shoe type mount. Best top mount option is the HDVF-L750, a full HD LCD panel, with lots of proper controls and features, including the ability to accept an external SDI input. This can be bought as part of a studio kit. The HDVF-L10 is the best monocular option, and is the one packaged as part of the ‘K’ kit version. Similar to the kind of viewfinder used on the PMW-F5 and other camcorders, with a flip up 3.5” LCD display type screen. The camera now incorporates quite a few focus assist type features which help the operators cope with the fact that viewfinder resolution is always playing catch-up with the camera resolution. RS422 data trunk connection for robotic heads. HD video trunk connection, so for instance you can plug a 1.5G SDI mini camera in to your FB80 via a BNC, and have it pop out of the HDCU....neat! Several package options available with various combinations of viewfinder, mic, CCU, and a Canon KJ20 lens. (Contact the guys at Finepoint for details). Like many other Sony camera systems, it’s made in Wales at the Pencoed Technology Centre. Great news for UK manufacturing, and good news if you need service and support! Sony’s low cost system camera has grown up rather a lot. It’s moved more to the mid range territory, with higher spec viewfinders and accessories, a motorised filter, solid build quality. As well as the ‘sensible’ box, it ticks a few more exotic boxes, with 1080p 50, UHD up-scaling, 12G and Rec. 2020 colour space. 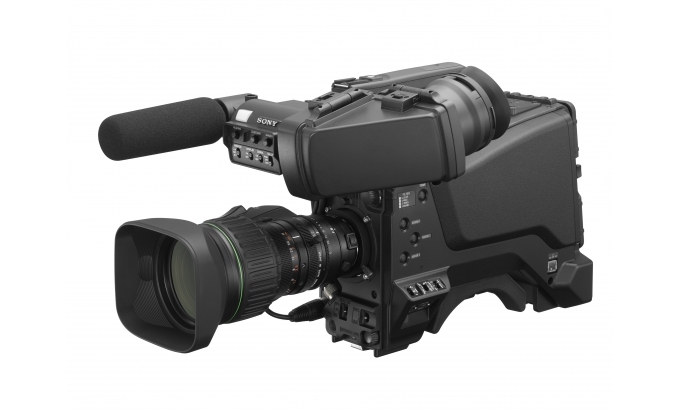 If you need a camera for ‘second tier’ UHD production, it may be just the thing.